Made for your extra large, difficult openings. – Control element ingress even on the biggest openings! 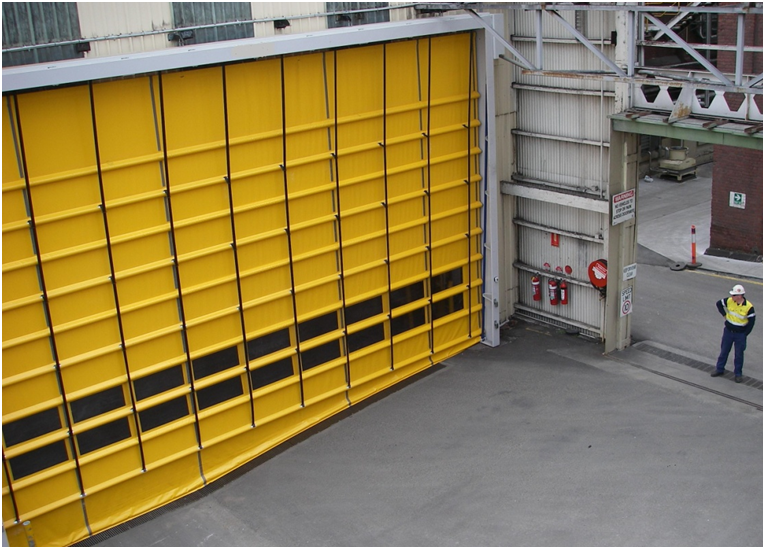 Strength– the design of the Extra Large Fold doors gives them superior strength-ensuring they will withstand very high winds – up to 110km/h – and harsh storms of other severe environmental conditions without damage. Rapid Acting – with opening speeds up to 1.2 m/s. Assurance – Simple manual release using a counterweighted release handle in event of power failure or similar. External Grade – Pre Painted Galvanized Steel Frame construction designed for external applications, & curtain designed for positive wind pressure areas. Safety – Adjustable infrared safety photocells detect traffic & reverse closing door. Additional Safety – Reversing sensor in bottom of curtain –assurance if all else fails!